While forbidding the public to observe all aspects of this government operation, the BLM is now releasing select information pertaining to deaths, some previously unannounced, resulting from the Calico roundup. We now learn that on Jan 23 a mare, at the holding facility, was stressed and struggled so much that she "ran into a gate and broke her neck." 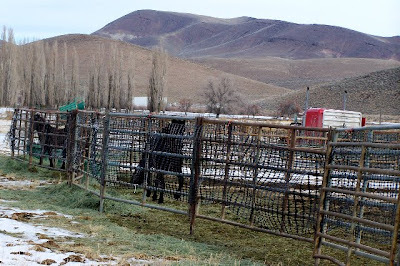 We are also now told that a stallion was found dead in a pen on Jan 14 (note: BLM waited 11 days to announce this death) and attributed his death to "failure to adjust to a change in feed." 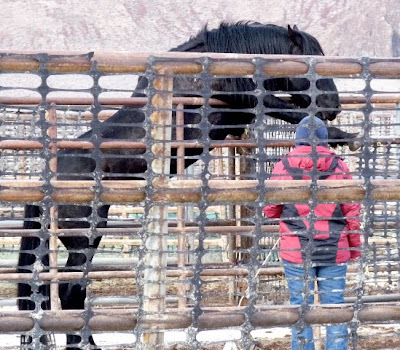 BLM does not reveal how long either of these horses were at the facility. For the BLM's latest laundry list of deaths and rationalizations click here. 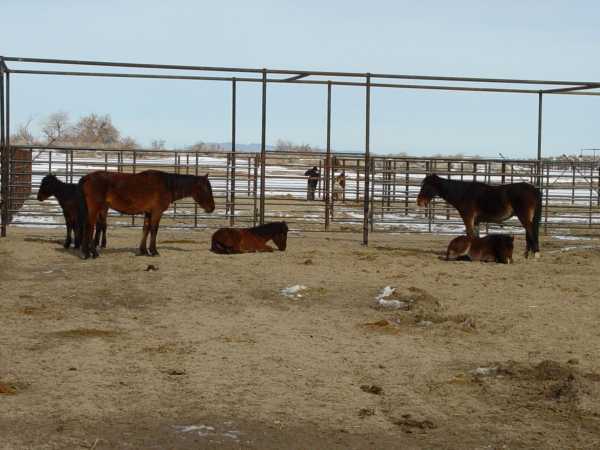 The BLM claims another horse died at the brand new "Indian Lakes" Fallon holding facility. 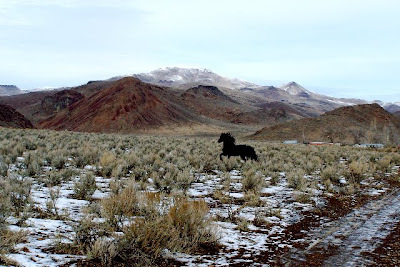 All the BLM states is: "One 12-year-old mare from the Black Rock West HMA died at Fallon. She arrived in weak and poor condition and had been at the facility for four days." 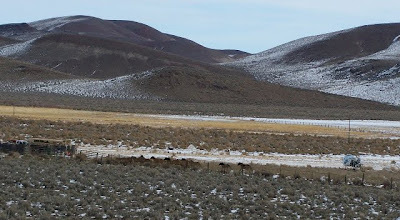 First the BLM traumatizes this foal by chasing him with helicopters to remove him from his home on the range. 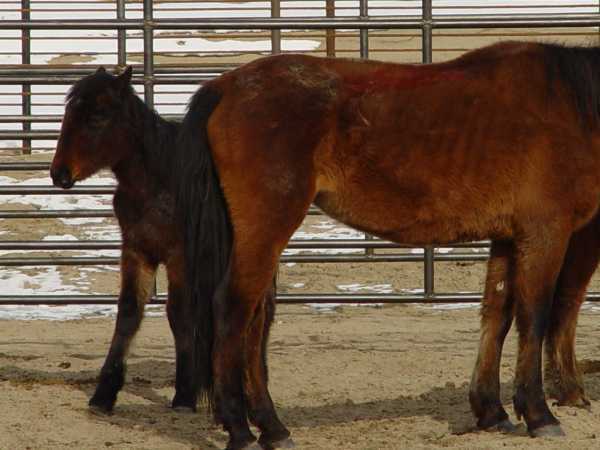 Somehow, inquiries have been submitted to BLM, this foal was separated from his mother - forcing this young calf to be on his own. Then he was trucked for hours, with other captured horses, to a holding facility where he was put in a pen with two mare/foal pairs. After he bonded with one of the mares - standing near her for comfort and security - the BLM then pulls him away from this mare and puts him by himself in a pen. 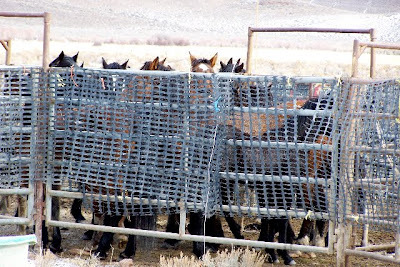 Once again the BLM claims to be doing this for the "benefit" of the horses. What a sad and tragic story. John Neill promised to provide an update on the "Calico orphan." I received the following report this morning. Willis, just a quick update on the orphan. He has been gaining strength each day. We did relocate him to an adjacent holding pen next to the pairs in order to provide him more nutrition than he would consume through oat hay. 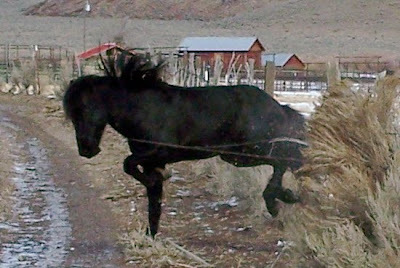 He presently has both oat hay and alfalfa along with BLM formulated pellets for foals. Dr. Sanford and I continue to monitor the health of the animals each day. 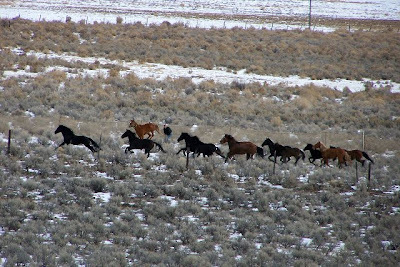 Below are photos of the roundup that took place today (Saturday, January 2, 2009) showing how the captured band stallion, "Freedom," valiantly fought for and regained his liberty although he had to leave his family of 8 adult mares and 2 colts. 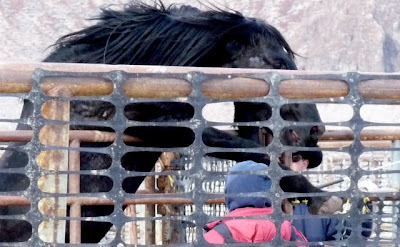 Jumping a 6-foot fence and immediately thereafter breaking through a barbed wire fence and injuring himself, this was an awe-inspiring, do-or-die effort demonstrating the loathing of captivity to a wild horse and his need for freedom. We can only pray for his recovery from the injuries he sustained from the barbed wire. 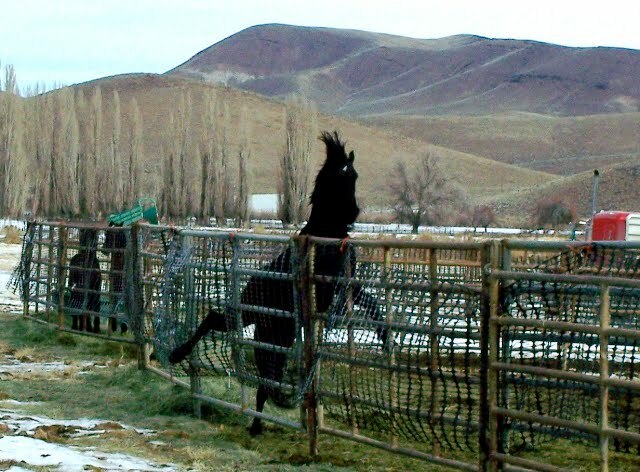 Before his escape, he became hung up by his front legs when he reared with all his might to attempt an escape from the narrow fenced area where he was being examined by Sue Cattoor and her wrangler. Also included here are shots of the capture of his entire band, the 11 horses including Freedom himself. More to come. Right now we are just sending stills. 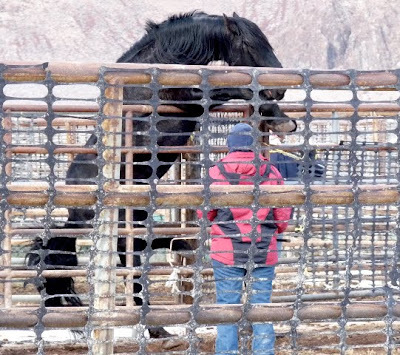 We have videos and interviews, but these photos really do capture the anguish and drama of the roundup for these majestic icons, our treasured American wild mustangs. Photography by Craig C. Downer 1/2/10 11:11:46 a.m. The capture of Freedom and his band by helicopter, 11 horses. Photography by Craig C. Downer 1/2/10 11:11:58 a.m. Band stallion, Freedom, in the lead. 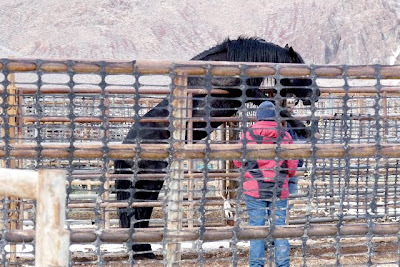 You can see the Judas horse, trained to run into the pens so the wild horses will follow, being released. Photography by Craig C. Downer 1/2/10 11:23:34 a.m. Desperate horses, Freedom and his family huddle together. Photography by Elyse Gardner 1/2/10 11:28:48 a.m.
During examination, Freedom attempts escape and gets caught up on the fence. Photography by Elyse Gardner 1/2/10 11:28:51 a.m. Slipping as he struggles to free his upper leg from the fence. Photography by Elyse Gardner 1/2/10 11:28:53 a.m. Photography by Craig C. Downer 1/2/10 11:30:18 a.m. Photography by Craig C. Downer 1/2/10 11:30:34 a.m. Photography by Craig C. Downer 1/2/10 11:31:33 a.m. Photography by Craig C. Downer 1/2/10 11:31:36 a.m.